The Hamilton Spectator certainly got it right concerning Auchmar in its editorial on April 29, 2011. "For Hamilton to reach its full potential in future, it has to support and appreciate its past, and treasures such as Auchmar are an important part of that equation. It's a place that oozes potential, located as it is on prime west Mountain real estate, ... . It is also worth noting that Auchmar should matter to city hall in part because it is located on the Mountain. Downtown Hamilton has no shortage of historically significant sites, but we sometimes forget our city's history also includes the Mountain, and Auchmar is a perfect manifestation of that truth." 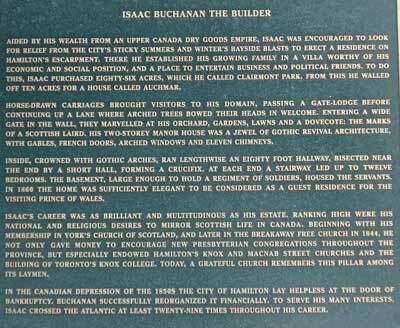 The home of Isaac Buchanan has been discovered by the people of Hamilton Mountain. Whenever the property is opened for public visits the response is phenomenal. There is widespread support for the idea that Auchmar deserves to be restored and made available to the public or retained for public use. The people have caught the vision of Auchmar as the Dundurn Castle of the Mountain. Over the years there have been several initiatives to get an Auchmar restoration project underway but each time things get bogged down. There are, however, still plans in progress and it is hoped that good things will yet be achieved. Admittedly, this is neither a simple nor an inexpensive project. However, there is substantial support in our community to see the heritage that Auchmar represents preserved. A group of citizens with an interest in the future of the Auchmar property have established Friends of Auchmar. The group held its inaugural AGM in October 2012 and has a website that highlights Auchmar and the activities of the group. Visit heir website at friendsofauchmar.com and consider lending your support to this initiative. There are a number of postings on You Tube that feature Auchmar. Most of them seem to be a reflection of the idea that abandoned buildings are all haunted but, that said, they often provide some interesting photographic and video material. For example, a selection labeled Doors Open Hamilton (Auchmar Estate), Sat. May 1, 2010, gives an impression of the present state of Auchmar. Disregard the overly dramatic background music and it is worth watching. Another interesting You Tube Auchmar selection is called Auchmar Estate (a peek inside) and is a collection of current and older photographs of the interior of Auchmar. Check back again to discover what else is happening on Hamilton Mountain. The banner graphic on this page depicts an old woodcut illustration of auchmar.